SÃO PAULO, Brazil – In a very dramatic and exciting finish, Andretti Autosport driver James Hinchcliffe, behind the wheel of his No. 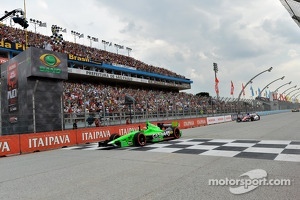 27 GoDaddy.com Chevrolet powered entry, won the 2013 Itaipava São Paulo Indy 300 on the Streets of SãoPaulo, Brazil with a thrilling last lap, final turn pass. 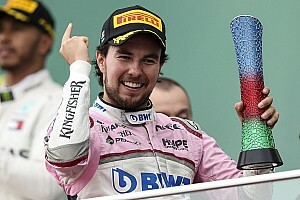 During the final laps around the 11-turn, 2.536-mile temporary circuit, the young Canadian driver closed the gap to move from third to second in the running order; and then pursued the leader, Takuma Sato. Still second as the pair took the while flag, Hinchcliffe waited for the perfect opportunity to make the pass, and score the win. "There's no cooler way to win a race than the last corner of the last lap,” said Hinchcliffe from Victory Lane. “Great job that Takuma (Sato) did to be up there, and man, he was making his car really wide. We both had one push-to-pass left coming to that last corner. He'd been defending the inside pretty well - almost too well a couple of times. He just out-broke himself a little bit. I know he was going to go deep, and we did the high-low and got the win. Awesome job for GoDaddy, Andretti (Autosport) and everybody." It was Hinchcliffe’s second win the 2013 IndyCar season, and second of his IndyCar career. His first win came at the season opener at St. Petersburg. 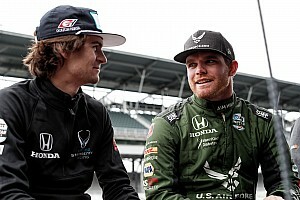 The win moved him to fourth in the standings as the series heads to Indianapolis for the 97th running of the Indianapolis 500. Hinchcliffe was joined on the podium by his teammate Marco Andretti who brought the No. 25 RC Cola Chevrolet to a strong third place finish. Andretti moved to second in the standings, just 13 points shy of the lead. Sato finished second, and assumed the points lead. "What a spectacular pass on the final corner for the win today for James Hinchcliffe at São Paulo!" said Chris Berube, Chevrolet Racing IZOD IndyCar Series Program Manager. 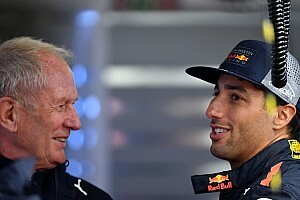 "James and his Chevrolet-powered Go-Daddy Andretti Autosport team did a stellar job managing the tires, fuel and overtake to enable that last lap surge and skilled over-under pass on the final turn to take the checker. Congratulations also to Marco Andretti on his third place podium finish showing great consistency and a new focus this season. 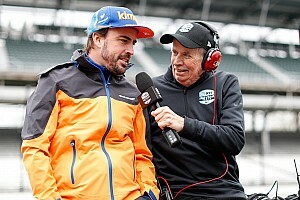 This result will provide great momentum for Team Chevy and our technical partners as we head into the Indy 500 phase of the season and focus on winning that most precious crown." Oriol Servia was a strong contender during the second half of the 75-lap, 190.2-mile race to bring home a fourth place finish behind the wheel of the No. 22 Valspar Panther Dreyer and Reinbold Racing Chevrolet to give Team Chevy three of the top-five finishers. Josef Newgarden was the fifth-place finisher. In total, Chevrolet drivers claimed half of the top-10 finishing positions. E.J. Viso, No. 5 Team Venezuela Andretti Autosport HVM Chevrolet was sixth at the checkered flag, and Simona de Silvestro, No. 78 Nuclear Entergy Areva KvVRacing Technology Chevrolet, finished in eighth place. Defending IZOD IndyCar Series champion Ryan Hunter-Reay, No. 1 DHL Andretti Autosport Chevrolet, led twice for a total of 16 laps, but a late-race flat tire relegated him to the 11th finishing position. São Paulo native Helio Castroneves, No. 3 Hitachi Team Penske Chevrolet, who held the lead in the point standings coming into today’s race, rallied from on-track altercations and multiple trips down pit lane to finish 13th. Castroneves now sits third in the standings, 20 points down from leader Sato. Sebastien Bourdais, No. 7 McAfee Dragon Racing Chevrolet, finished 14th, and JR Hildebrand brought the No. 4 National Guard Panther Racing Chevrolet scored the 15th place finish. Local favorite, Brazilian Tony Kanaan, No.11 Itaipava KV Racing Technology SH Racing Chevrolet, thrilled the crowd by leading twice for a total of 12 laps racing with an injured hand from an accident at Long Beach. A late-race multi-car tangle relegated Kanaan to the 21st finishing position. Will Power, No. 12 Verizon Team Penske Chevrolet, winner of the three previous São Paulo races, who started 22nd after a disappointing qualifying effort, was working his way through the field to knock on the door of the top-10, when a mechanical issue sidelined him on the 18th lap of the race. He was scored with the 24th finishing position. JAMES HINCHCLIFFE, NO. 27 GODADDY.COM ANDRETTI AUTOSPORT CHEVROLET, RACE WINNER: ON THE TURN 11 PASS, LAST TURN PASS TO WIN ON A STREET COURSE: "There's no cooler way to win a race than the last corner of the last lap. Heluva job that Takuma (Sato) did to be up there, and man, he was making his car really wide. We both had one push-to-pass left coming to that last corner. He'd been defending the inside pretty well - almost too well a couple of times. He just out-broke himself a little bit. I know he was going to go deep, and we did the high-low and got the win. Awesome job for GoDaddy, Andretti (Autosport) and everybody." WERE YOU SURPRISED AS TO HOW GOOD THE CAR WAS? "I wasn't thrilled after warm-up. I like I said, I was P21 in warm-up in St. Pete, and we didn't read a lot into it. We through a bunch of changes in the car, and I made a mistake in the first pit stop that put us back out of sequence and we had to come back for a bit more fuel under one of those cautions there. It was of those things that came together. The guys were awesome in the pits and the race strategy at the end of the day. The GoDaddy car had it in it." WHAT WAS THE RACING LIKE IN THE FINAL MINUTES? "I had to work for it. That last restart I lost a position to (Simon) Pagenaud and to Josef Newgarden and we'd fallen back. But I knew once the tires came up, we were a little bit quicker, and as soon as I cleared Pagenaud, I tracked down those guys (Sato and Newgarden), thank goodness they were racing or I never would have caught them. I managed to get Newgarden when he was battling, and got Sato there at the end. It is awesome to get this second win of the season for Andretti Autosport and GoDaddy. My family is all at home, watching it, I know that, so hi to you guys. One was good, but two is better!" MICHAEL ANDRETTI, TEAM OWNER, ANDRETTI AUTOSPORT: ON THE FINISH OF TODAY’S RACE: That’s IndyCar racing. That’s what it’s about. It seems that so many of these races go down the last turn of the last lap. That’s what makes this such a great sport. I’m glad we came out on the good end of the stick for sure. It’s awesome to have two cars on the podium. Ryan was on pole but unfortunately had bad luck with a flat tire, which if not for that, I think he would have been on the podium as well. All-in-all it really was a great weekend for the whole Andretti Autosport group. (Strategy for James heading to the end): Finish ahead of the cars in front of you (laughter). That was basically it, and that’s what he did. MARCO ANDRETTI, NO. 25 RC COLA ANDRETTI AUTOSPORT CHEVROLET, FINISHED 3RD: ON THE RACE: "It was a lot of fun. It was dicey at some points, but really it was just about conserving the push to passes for when it counted. At the end there, I was kind of using them when people weren't expecting me to use it so I could kind of snooker them. Looking from practice one, I am quite pleased with where we ended up today. Congratulations to the Go Daddy crew. The R C (Cola) car is looking good in points." WILL POWER, NO. 12 VERIZON TEAM PENSKE CHEVROLET, RETIRED FROM COMPETITION ON LAP 18 WITH MECHANICAL ISSUES FINISHED 24TH: ON WHAT HAPPENED: "Obviously burned something with the gear shift, because it stopped shifting because I looking for the manual shift. Yes, it was a fire, but we don't know happened.